"Mountainside Valley's been known for its vast mountain ranges. 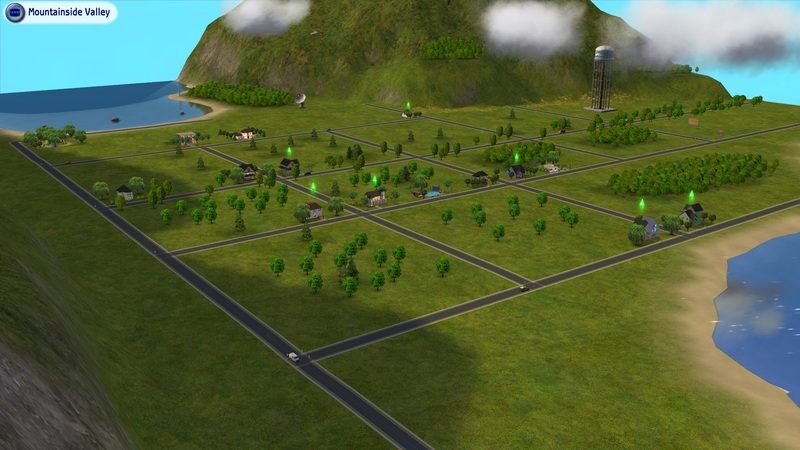 Many sims from all over the world move to this seemingly quiet little town, seeking inspiration, love or a better life. Is it the mountains that attract the sims? Or the fresh air? Or maybe the friendly sims around town? Who knows what this place among the mountains, down in the valley has in store?" However, if you don't have Pets or a later EP/SP installed, you can temporarily remove Bluewater Village (B001) from the NeighborhoodTemplate folder and move this subhood in there. It will still be referred as Bluewater Village in the game. But the game will add Mountainside Valley to your neighborhood. Restore B001 after adding the subhood and you're done. Mountainside Valley has its own custom SC4 terrain. But there's no need for a camera mod. You will see all of the lots in a vanilla game. You may need to rotate the camera to see some of the lots, though. We have 7 households in this neighborhood. They're all mostly families but there's 1 roomate household. So, you won't end up with just families. Some of them are easy to play and some are (a bit) challenging. You can read more about the residents, their houses, and the community lots of the neighborhood in the comments for this thread. Each family should have 5 storytelling pictures in their family album. 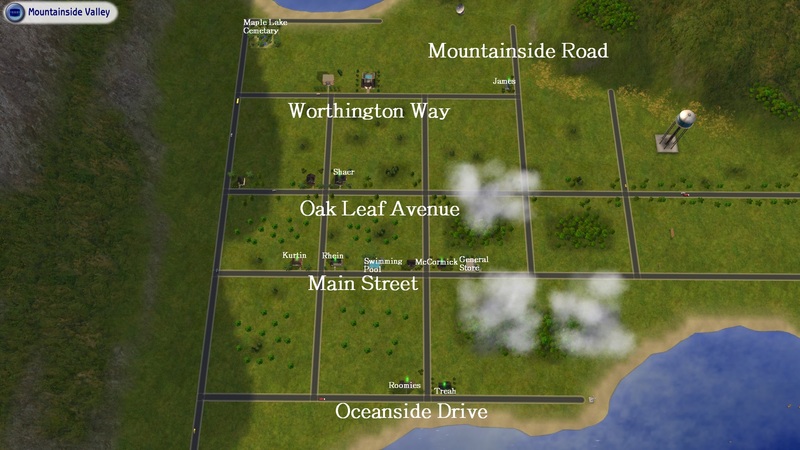 This neighborhood has been created with AnyGameStarter with no Maxis content, so there aren't any townies. You have to generate them yourself if you want them. You'll find a ghost who haunts the Rhein house. If you don't want the ghost, we have created a cemetary lot for this neighborhood so you can move his urnstone to the cemetary. You need Nightlife for this. If you don't have Nightlife but later EPs. Then you can put the urnstone into the inventory of any sim and visit the cemetary lot with that sim. Then you can click on the ground and choose the option to place the tombstone. You can read more about that lot in the comments for this thread. By the way, there are unoccupied lots in this neighborhood but they are empty inside. We wanted to give you the ability to create your own unique houses using those lots. Mountainside Valley is base game compatible and doesn't have any CC in it. We left some space for you to place more lots, for instance for EP lots (like dog park, or a nightclub,...). This is a group project which we finally completed. Yay! We're going to create more neighborhoods in the future. Look at this thread and this for more information. We always accept applications. I hope you like this neighborhood. To Mootilda for her Lot Compressor which we used to compress all of the lots, and her fixed subhood selection , which we used for the subhoods. To the others - who helped us and gave some feedbacks or suggestions in this thread and this thread. Of course to those - who have playtested this neighborhood. To litlegothcat13 for converting Meadow Creek and Mountainside Valley into subhoods. To Orilon for for reporting the age issue in the Roomies household. 272 people have said thanks to Hood Building Group for this download. Documents\EA Games\The Sims 2\Neighborhoods folder. in order for it to function properly. Later EPs do not have this requirement.